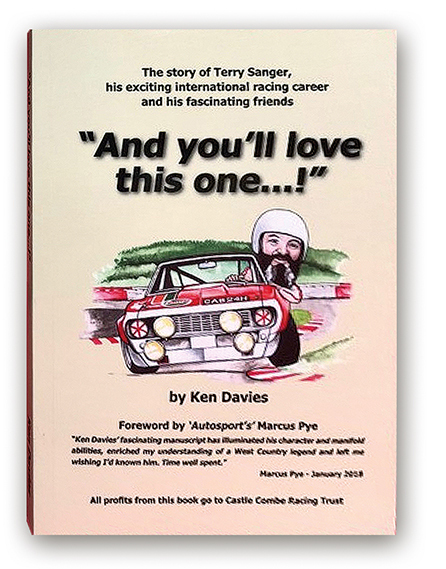 Bay’s motoring contributor Liam Bird reviews the story of Terry Sanger, his exciting international racing career and his fascinating friends. I must admit that I’d never heard of Terry Sanger until editor Lesley sent me And You’ll love this one…! by Castle Combe Racing Club chairman, and fellow Guild of Motoring Writers member, Ken Davies – who incident-ally, lives on Gower. Terry Sanger was an engineer – first with Bristol, the car and aeroplane maker, and later with Marcos and ERA, and an all-round larger-than life guy who apparently didn’t suffer fools gladly. He was also a racing driver. If you’ve read the usual pre-Christmas sales-drive (pardon the pun) racing driver’s biography, and you’re becoming tired of discovering such gems as what Carlos Fandango’s nutritionist’s advice for him after the post warm-up lap massage session was, well, this book is entirely different. Terry Sanger drove all kinds of cars – from lightweight Austin 7s and delicate Formula 2 Coopers, to brutal V8 powered Ford GT40s and the yank-tank bruiser that was his Chevrolet Camaro – in all kinds of races. He competed in the legendary Targa Florio, not to mention Formula 5000 and the British Saloon Car Championship (the pre-runner to today’s British Touring Car Championship) and all at a time when a racing driver was more likely drive their own race-transporter and be accompanied by a socket-set and trolley jack, than they were to have a private jet and a 40 strong team of race engineers, publicists and a personal-trainer. Proper racing, for the love of it before the sponsors and the money took over. Author Ken Davies has compiled a host of stories and anecdotes from interviews with many of Terry Sanger’s closest friends, and one tale seems to bounce off another. The chapter about the ex-Vanwall Maserati 250F being discovered, and then bought for £50 is worth the £12 cover price alone; 250Fs now sell for sums that are strictly price on application. All profits from the sales of And you’ll love this one…! will go to the Castle Combe Racing Trust which was set-up with the objective of helping deserving causes at Castle Combe and occasionally, the wider motor racing spectrum. Contact Ken Davies direct at kend@ccracingclub.co.uk if you’d like your own copy.